Two corn tortillas filled with a combination of shrimp and crab, topped with a cheddar and jack blend. Choose between pork green chile or Chipotle cream sauce (vegetarian). Served with spanish rice, beans, sour cream, guacamole and Pico de Gallo. A blend of grilled chicken and green chiles wrapped in two corn tortillas topped with a cheddar and jack blend. Choose between pork green chile or Chipotle cream sauce (vegetarian). Served with spanish rice, beans, sour cream, guacamole and Pico de Gallo. Your choice of grilled chicken, Portobello mushroom or seasoned ground beef, sauteed onions & peppers, beans and rice all wrapped inside a herb tortilla. 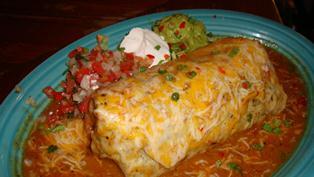 Smothered with homemade green chile or chipotle cream sauce and melted cheese. Comes with sour cream, Pico de Gallo and guacamole. Substitute steak or shrimp. Roasted Poblano chili with gulf shrimp and a blend of cheddar and Jack cheeses. Lightly fried in a crispy wrap. 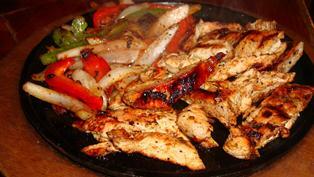 Smothered with your choice of Green Chili or Chipotle Cream Sauce. Served with beans, rice, sour cream, guacamole and Pico de Gallo. Your choice of chicken, seasoned fish, Portobello mushrooms, steak or shrimp grilled with either our blackened, grilled, jerked, or garlic curry seasonings. 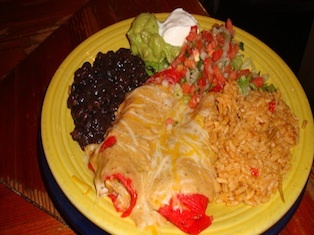 Fajitas are served with black beans, spanish rice, peppers and onions, cheddar and jack cheeses, sour cream, guacamole, pico de gallo, and red chili tortillas. 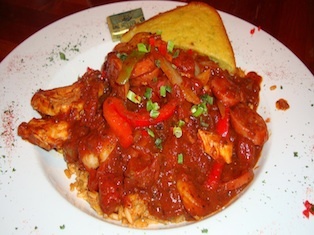 A combination of shrimp, chicken, Cajun sausage, onions and peppers served over rice in a tasty Creole sauce. Served with jalapeno corn bread. A delicious blend of chicken, shrimp, peppers, onions, broccoli, pineapple and mandarin oranges tossed in our homemade Thai sauce served over our hot & sour noodles. Topped with chow mein noodles. 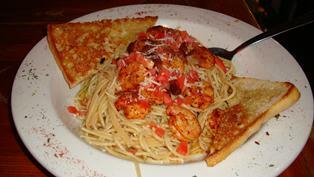 Lightly blackened shrimp in a white wine garlic butter sauce topped with diced tomatoes bacon and parmesan cheese. Served over pasta with grilled focaccia bread. Shrimp, artichokes, tomato and spaghetti tossed in a creamy spinach garlic sauce and topped with parmesan cheese. Served with grilled focaccia bread. Lightly beer battered filets, golden fried and served with homemade tartar sauce, seasoned fries and coleslaw.